This lithium-ion battery lets you power your cordless tools the eco-friendly way. It is compatible with all Snow Joe and Sun Joe iON models. Simply insert the EcoSharp battery pack into your iON tool of choice and power up instantly without having to mess with gas, oil, pull-cords or tangled extension cords. The battery pack provides for cleaner, emission-free air during operation. Although run times will vary depending on the tool used and the job performed, up to 50 minutes of whisper-quiet operation is a good approximation of what to expect from your iBAT40-powered tool. The iBAT40 holds its charge well in storage and will retain up to 65% charge for six months. Easy, convenient, reliable and super-lightweight (only 2.6 lbs. ), the 40V EcoSharp iBAT40 is the smart way to battery pack for your power trip. The new 2.0 Ah 18 V Bosch SlimPack battery offers more run time and 2x longer life with unique CoolPack Design technology. The advanced heat conductive housing keeps the battery cooler for long life. The compact size and lightweight make it perfect for professional work overhead. An integrated fuel gauge makes checking charge status quick and easy. And working in cold weather is no issue down to -4F. The BAT612 is compatible with all Bosch 18 V Lithium-Ion power tools, radios and more. The new 4.0 Ah 18 V Bosch SlimPack battery offers up to 65% more runtime (compared to Bosch 3.0 Ah) and 2x longer life with unique Cool Pack design technology. The advanced heat conductive housing keeps the battery cooler for long life. An integrated fuel gauge makes checking charge status quick and easy. And working in cold weather is no issue down to -4F. The BAT620 is compatible with all Bosch 18 V Lithium-Ion power tools, radios and more. The new EGO POWER+ Snow Blower is the only cordless snow blower that delivers the power and performance of gas without the noise, fuss and fumes. Featuring Peak Power technology, it combines the power of any two EGO 56V ARC Lithium batteries for superior clearing power, even in heavy, wet snow. Built with a high-efficiency brushless motor and a 21-inch wide intake, the EGO POWER+ Snow Blower can handle it all, even what the city snow plow leaves behind. Easily adjust the variable-speed auger to control how far the snow is thrown, up to 35 ft., for maximum control. A robust handle-mounted chute-adjustment lever puts the user in control when re-directing the snow up to 180 from side to side. 2 bright LED lights make it convenient for use early in the morning or at night and the robust steel chassis is built for aggressive use in demanding conditions. Compatible with all EGO ARC-Lithium 56V batteries (4.0 Ah or greater recommended). All EGO tools, batteries and chargers are 100% compatible so owners can build the combinations they need and maximize their value. Experience Power Beyond Belief with the EGO POWER+ Snow Blower and the entire EGO POWER+ lineup. Hilti's B22/2.6 CPC Li-Ion Compact Battery is the essential battery platform for Tradesmen who require lightweight performance and durability. This battery is the perfect add-on to an existing Hilti 22V Li-Ion Compact Class Kit because it has the power to tackle tough applications and it is backed up by an industry leading commercial use warranty. This battery is an excellent way to upgrade existing Hilti 18V Li-Ion Compact Class kits and give you more work-per-charge because they are backwards compatible with Hilti's existing 18V Li-Ion Compact Class kits. iON 40V EcoSharp 4 amp Li-Ion Battery This lithium-ion battery lets you power your cordless tools the eco-friendly way. It is compatible with all Snow Joe and Sun Joe iON models. Simply insert the EcoSharp battery pack into your iON tool of choice and power up instantly without having to mess with gas, oil, pull-cords or tangled extension cords. The battery pack provides for cleaner, emission-free air during operation. Although run times will vary depending on the tool used and the job performed, up to 50 minutes of whisper-quiet operation is a good approximation of what to expect from your iBAT40-powered tool. The iBAT40 holds its charge well in storage and will retain up to 65% charge for six months. Easy, convenient, reliable and super-lightweight (only 2.6 lbs. ), the 40V EcoSharp iBAT40 is the smart way to battery pack for your power trip. iON 40V EcoSharp 4 amp Li-Ion Battery is rated 4.1 out of 5 by 27. Rated 4 out of 5 by Ruth from Great battery! 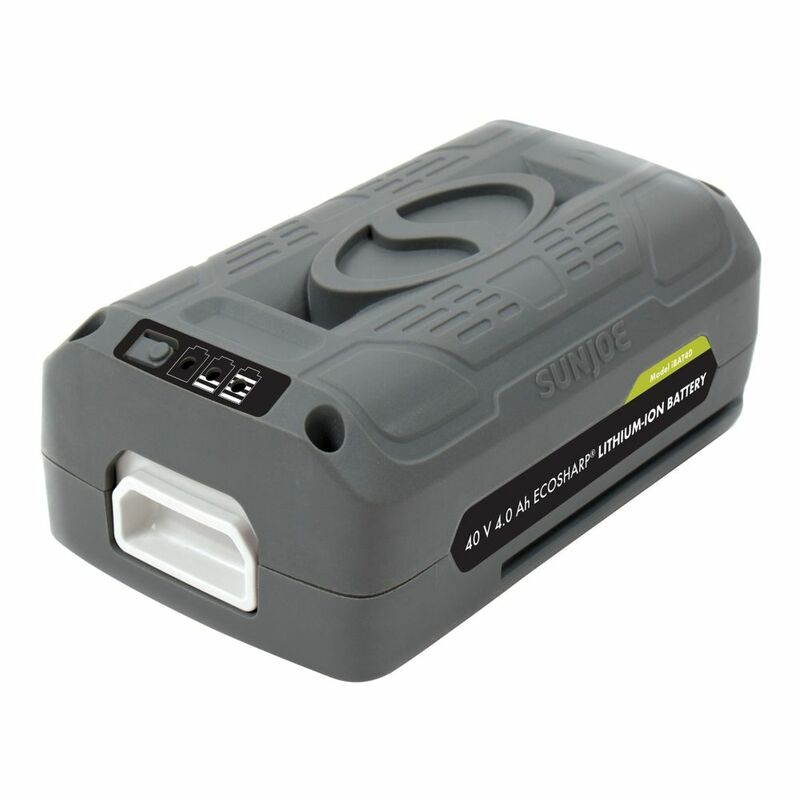 Bought as a backup for those fun snowstorms.... Great battery! Bought as a backup for those fun snowstorms. Rated 3 out of 5 by Skeptical from Doesn't hold a long charge. Doesn't hold a long charge. Rated 5 out of 5 by Guy10 from Perfect size machine for my needs This machine is just the right size and weight for cleaning snow from my deck. It has more than enough power to handle the job. Rated 5 out of 5 by Eligio from Good product.... Good product.